Our understanding of weather and climate has grown over centuries. Science has taken the place of guesswork and superstition. This two-volume Encyclopedia summarizes present knowledge in more than 1400 cross-referenced entries' illustrated by more than 350 maps, charts, diagrams, and photographs. This edition has been completely revised and is substantially different from the first edition. Many of the individual entries in the first edition have been assembled into much longer essays, which is why the total number of entries is now smaller. Other entries have been moved to the appendixes. 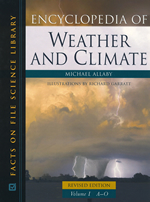 There are 10 of these, including biographical details of more than 100 important figures in the development of the atmospheric sciences, details of past tropical cyclones and storms, and a chronology of relevant discoveries. You can use the Encyclopedia to learn how different processes cause the weather we experience day by day. What causes blizzards, ice storms, tornadoes, hurricanes, and ice ages, as well as ordinary rain showers, dew, fog, and the different types of frost. All these are explained. You will also read about how ideas developed, how meteorological instruments came to be invented - and by whom - and how they work. The first edition of the Encyclopedia was rated among the top 10 scientific reference sources in 2002, by Booklist, and the School Library Journal described it as “A much-needed resource that does not disappoint”. Kathleen A. Welton, Library Journal, October 1, 2007. Did you know that the papaya plant has 31 genders to choose from? Did you know there are flowers that never emerge above ground? Did you know that avocado flowers are female one day and male the next? Did you know that scientists managed to germinate a 2000-year-old seed found in a jar in the palace of Herod the Great? Did you know that the world’s driest desert is covered in ice? Did you know it might have been climate change that sent Mongolian invaders westward into Europe in the thirteenth century? Did you know that mowing and grazing make grass grow? Did you know That Elizabeth I refused to enter London in 1578 because the air smelled so bad? Did you know that the scientist who suggested continents move was a meteorologist who died in Greenland? Did you know that the first person to enter the stratosphere went there by accident - in a balloon? Did you know that a Prussian scientist was said to be the second most famous person in Europe - after Napoleon? Did you know that in Iowa it once rained unopened cans of soda? Did you know that a typhoon once saved Japan from being invaded? Did you know that the word “gas” began as “chaos”? Did you know that Benjamin Franklin was the first person to place the Gulf Stream on a map? Did you know that a large area of the Amazon rain forest was once farmed by people who lived in large villages? Did you know that in one winter nearly 17 feet of snow fell on Buffalo, New York? Did you know that an elephant owned by King James I and VI was fed on nothing but wine? Did you know who invented botanical illustration and wrote the first botanical glossary?